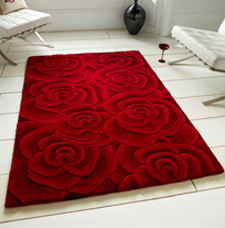 Valentine is a stunning collection of modern super hand-tufted floral rugs. Clever use of colours and the careful application of a multi-level pile structure are two of techniques used in the making of this collection. The result is a stunning three dimensional effect that is visually dazzling. In addition to being ultra chic, Valentine rugs are heavyweight, dense and pleasantly soft to the touch.